By definition, embezzlement is the act of dishonestly appropriating assets by one or more individuals to whom such assets have been entrusted. It may range from the minor, involving only small amounts of money, to the immense, involving large sums and sophisticated schemes. Embezzlers conceal their activities from other individuals, only taking a small portion of the funds received, in an attempt to minimize the risk of detection. If successful, embezzlement may continue for years without detection. Victims typically realize the funds are missing when they need to access the money and its not there. According to the Association of Certified Fraud Examiners, 3 out of 4 physicians will suffer a significant loss due to theft during their careers. It is not enough to just make money … you must protect it once it enters the practice. Since embezzlement is fraud frequently perpetrated by trusted employees, it is important for owners to remain objective and aware. 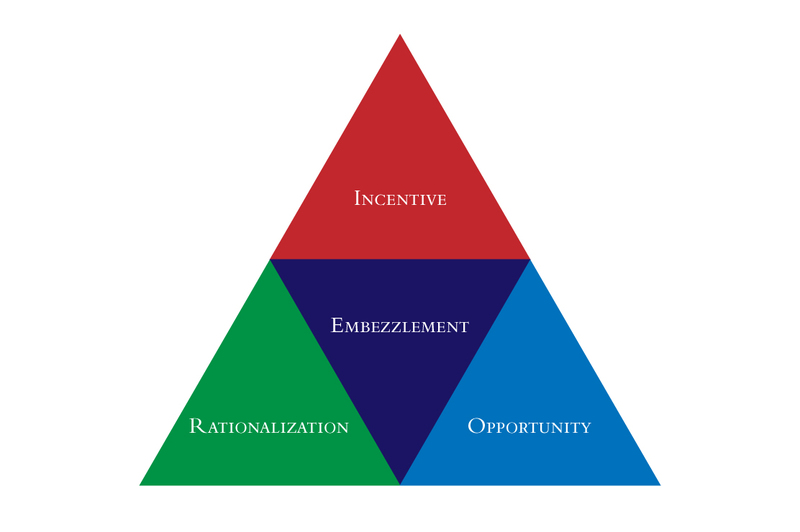 In the 1940s researcher Donald R. Cressy developed the “fraud triangle” to describe the three elements required for someone to commit fraud: employee “need” + rationalization + opportunity = workplace fraud. Cressy’s “fraud triangle” concept applies in medical practices today. Employee “needs” are a driving force in premeditated embezzlement. These needs may be real (house mortgage, college tuition, medical bills) or perceived (expensive lifestyle, substance abuse/addition.) Either way, they can lead an employee to consider practice funds a source to fulfill their needs. Pocket Cash – The bulk of thefts occur at the front desk. In this age of higher copays and deductibles, employee pockets the cash received from patients prior to appointments. Secret Bank Accounts- Employee opens a new account in the physician’s name, deposits funds into it with a signature stamp, and treats it as his own. The physician never knows this account exists. Invisible write off – Employee cashes checks themselves, or takes cash payments, and makes those “disappear” by writing it off on patient accounts. Office Pilferage – Employee uses postage, makes personal copies, falsifies time cards, places long-distance personal calls, and/or takes medical supplies, medications and medical equipment. These “small” thefts amount to significant losses over time. Jealousy over the physician’s earning capacity. We strongly recommend that physicians not discuss their personal finances with the staff, including asking employees to do personal banking or investing for the physician. Entitlement brought on by an employee feeling under-appreciated. “I deserve this because..” I work long hours for which I’m not compensated and the doctor(s) never even say thank you. Denial that what employee is doing is wrong. In this situation, embezzlement may start small because it was convenient and seemingly insignificant, and increases in scope over time. Small and medium-size practices are particularly prone to employee embezzlement because they have fewer employees to divide and assign duties. By default, one individual may take the lead on all financial matters, thereby jeopardizing the practice. One solution is outsourcing to an objective and highly regarded billing company, you may minimize that risk. If you prefer to keep these tasks “in-house”, next month’s blog will address specific procedures and solutions you may employ to safeguard your revenue – so be sure to check back here! Do you think members of a medical practice billing department could deposit checks from patients into their own accounts? Or from insurance checks sent to patients, and endorsed over to the practice?? Absolutely! They can and the DO. This is often how we acquire new clients – they realize something is “off” with their in house billing department and come to us for help. A small practice needs checks and balances in place to prevent embezzlement and they are so busy trying to do everything a small practice needs to do, that they often overlook this piece of the business. I think this can happen in larger practices as well. Ami, would you mind emailing me or calling me tomorrow with your contact information? rsmith718@optonline.net. 631-921-4560.